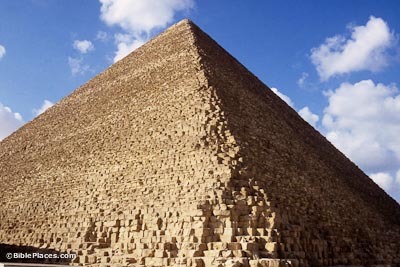 There are 67 completed pyramids in Egypt and 25-26 incomplete pyramids. 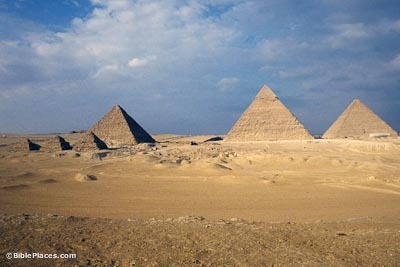 Ten pyramids are on the Giza plateau, including the two largest. The significance of the shape of the pyramid is debated, but many scholars believe that the pyramids represent rays of the sun as seen coming down from behind a cloud. In mortuary temples, there are references to the soul of the king ascending along the ramp of the sun’s rays to the sun god himself. The pyramid of Cheops is the largest pyramid in Egypt. Previously it was estimated that it consisted of 2.3 million limestone blocks, but a recent project by the Supreme Council for Antiquities in Egypt estimates only one million stones were used. The majority of blocks weigh 2-5 tons; some weigh 15 tons.The granite blocks inside the burial chamber weigh 50 tons. 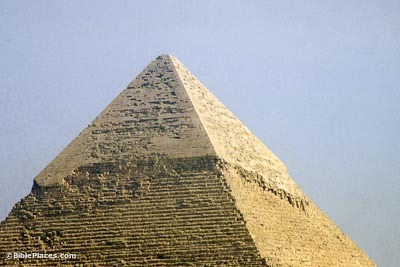 The original height of the pyramid was 146 meters; today it is 137 meters high. The decrease in height is because the outer casing is missing. The outer covering of this pyramid was originally very pure white limestone which would have shone like gold in the sun. 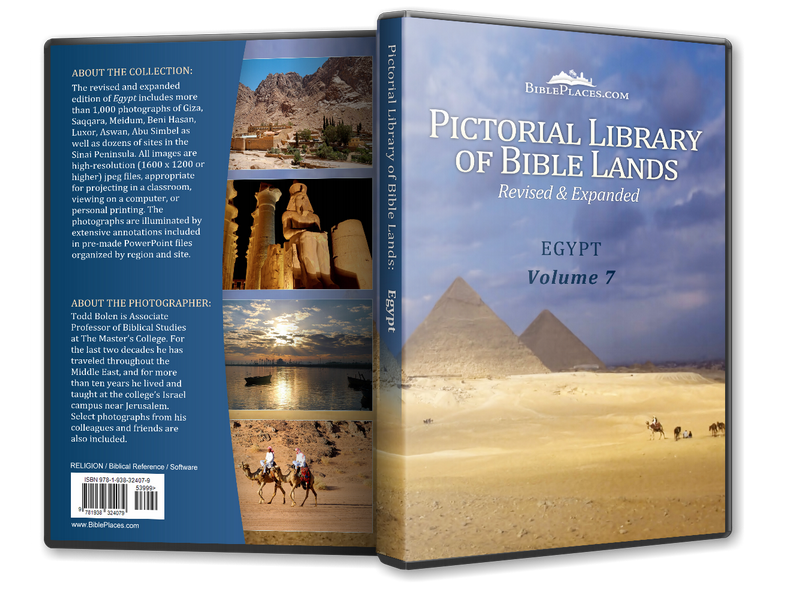 It was robbed away for use in building the modern city of Cairo in the Middle Ages. The white limestone coating is preserved only on the top of Chefren’s (Kafre’s) pyramid. The pyramid was only part of a large funerary complex. When the pharaoh died, the high priest performed the “opening of the mouth” ceremony at the Valley Temple. Then the body would be transported past the Mortuary Temple where the relatives stood to give offerings (milk, water, beer, and wine). 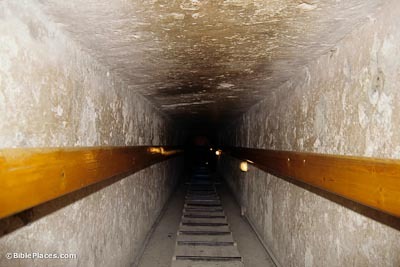 After this, the body was taken into the pyramid and the pyramid was sealed – never to be opened again. To visit the pharaoh, the mourners would go to the Mortuary Temple. Food was brought to feed his ka (spirit). 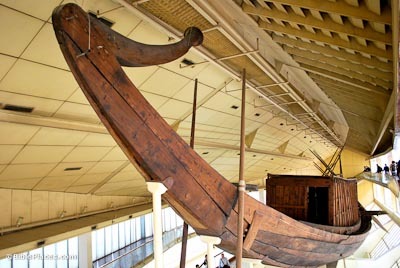 In a pit by the Great Pyramid, archaeologists discovered a boat made of cedar wood, 142 feet long and 20 feet wide. After being built, the boat was dismantled into 1224 pieces and buried. The individual boards were not put together by nails or pegs, but holes in the boards allowed the boards to be sewn together with rope. This was a very effective method since wood expands when it is placed in water. In many cases, boats were buried on all four sides of the pyramids. They were probably intended for the pharaoh to be able to sail in any direction from the pyramid. Before building a pyramid, the engineers of Pharaoh Chefren found a location with a suitable quarry close by. When they hit a section of friable limestone that crumbled easily, the decision was made to carve it into a Sphinx. The Sphinx is 57 m long and 20 m high. The Sphinx likely bears the face of Chefren (Kafre), the builder of both the Sphinx and the second largest pyramid. 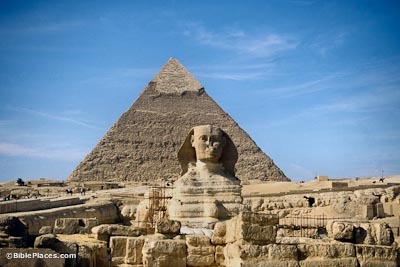 The Sphinx was buried in sand until 1926; it was restored between 1988-1998.